Richard Baker "Monster Trap." Image courtesy of Melissa Morgan Fine Art, Palm Desert, California. 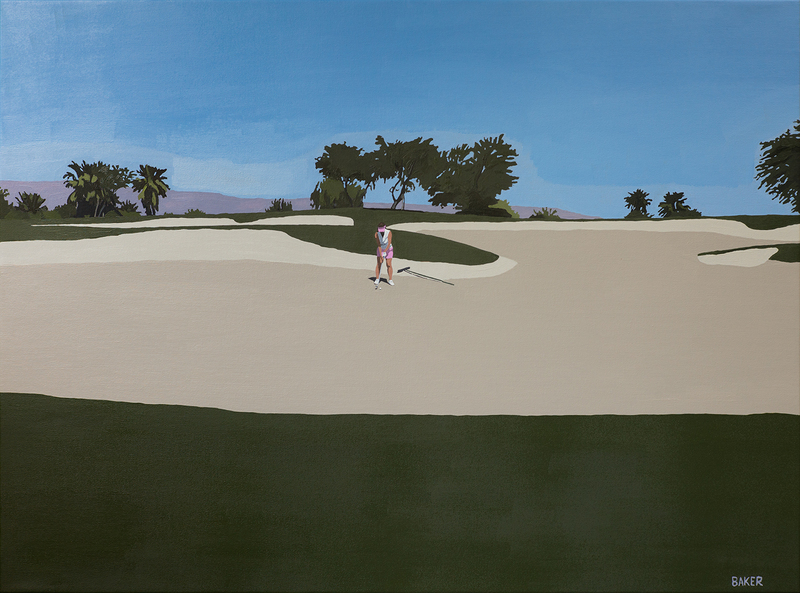 On Friday, January 2, 2015, Melissa Morgan Fine Art, a contemporary gallery in Palm Desert, California, will present the newest body of work from painter Richard Baker. “Desert Scenes” features sun-drenched canvases depicting popular leisure activities among desert dwellers, including horseback riding, golf, and tennis. Baker, who studied painting at the University of Pennsylvania under the celebrated British-born realist painter Rackstraw Downes, is highly influenced by cinematography, which stems from his professional experience as a leading film and television producer. Employing dramatic compositions, heavy brushstrokes, and exaggerated colors, Baker adds a surreal quality to everyday scenes, creating paintings that toe the line between realism and material abstraction. 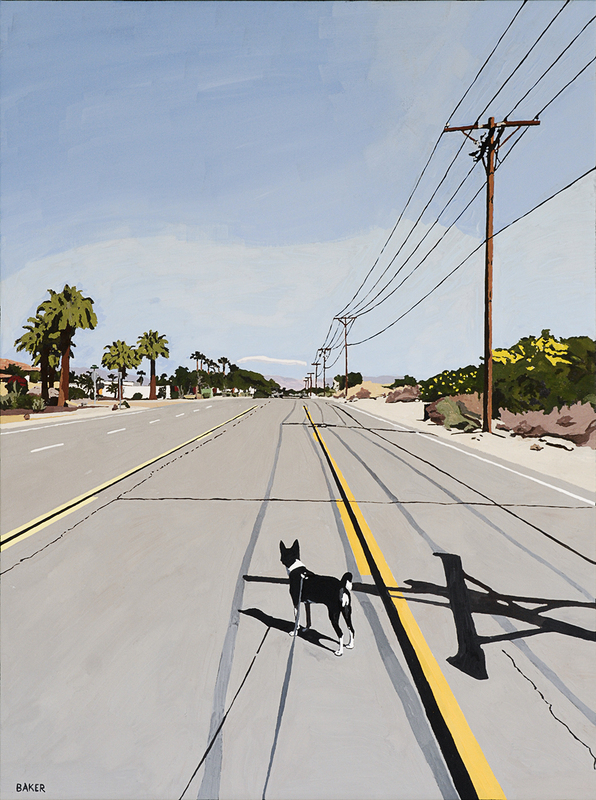 Richard Baker "Ave. 58 Facing East." Image courtesy of Melissa Morgan Fine Art, Palm Desert, California. Baker’s brilliantly colored works also explore the role of figuration in painting -- a topic associated with the mid-twentieth century Bay Area Figurative Movement -- another source of inspiration for Baker. Led by artists such as Wayne Thiebaud, David Park, and Richard Diebenkorn, the Bay Area Figurative Movement called for the return of figurative representation in painting, which disappeared from the medium with the rise of Abstract Expressionism during the first half of the century. Baker recalls these champions of figurative art in his own approach to representational painting. An opening reception for “Desert Scenes” will take place at Melissa Morgan Fine Art from 5:30PM to 7:30PM on Friday January 2, 2015. The show will be complemented by concurrent exhibitions for acclaimed Bay Area artists, Eric Zener, a photorealist painter best known for his depictions of figures in swimming pools, and Suhas Bhujbal, who creates paintings inspired by architecture and abstract city settings. Established in 2003, Melissa Morgan Fine Art features paintings, drawings, photography, sculpture, and studio glass by emerging, established, and well-known artists from around the world. For more information, visit www.melissamorganfineart.com.